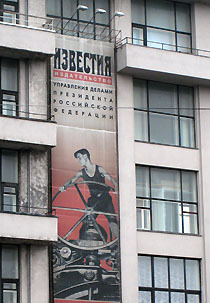 Izvestia, still a Russian daily newspaper, was the official newspaper of the Soviet government (in contrast to Pravda which was the Party newspaper). 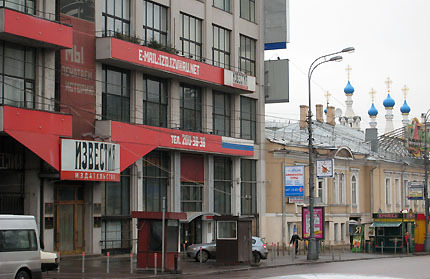 The Izvestia buidling in Pushkin Square was built ten years after the Revolution to house both the offices and printing presses of Izvestia and other papers. 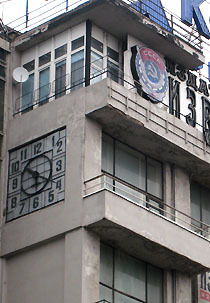 The building facade is heavily glazed and asymmetrical in the Constructivist style, based on a square grid of reinforced concrete. The circular windows in the top floor are for the editorial offices of the paper. The building was much extended towards Tverskaya Ulitsa in the 1970s, but the original building and its detailing are relatively unaffected. 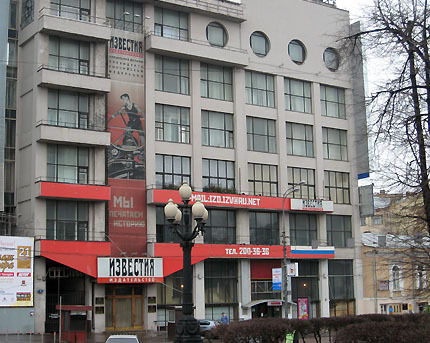 The Izvestia building is on the North side of Pushkin Square, just off Tverskaya Ulitsa. Nearerst Metro stations are Pushkinskaya, Tverskaya and Chekhovskaya, which are all close to the Square. copyright © galinsky 1998-2007. e-mail info@galinsky.com.